There has been a sauerkraut attack reported in Florida. 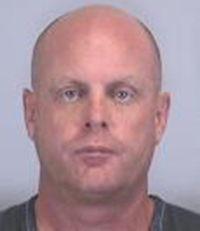 According to police, Matthew Burnett, 40, "smashed a plate of sauerkraut" into the face of his girlfriend during an argument Tuesday evening at a Ramada Inn in Sarasota. Burnett and the 36-year-old victim met online and have “been together off and on for ten months,” cops noted. Following the sauerkraut assault, Burnett allegedly shoved the victim against a wall and then later grabbed the woman’s glasses off her face, resulting in a minor injury. Pictured at right, Burnett was arrested on a misdemeanor domestic battery charge and booked into the county jail (from which he was released on $500 bond). Burnett, who manages a Sarasota restaurant, is scheduled for a September 22 court hearing.